The High-Luminosity LHC, which is expected to be operational after 2025, will increase the LHC’s luminosity by a factor of 10. Luminosity is an important indicator of the performance of an accelerator: it is proportional to the number of collisions that occur in a given amount of time. The higher the luminosity, the more data the experiments can gather to allow them to observe rare processes. To achieve this major upgrade, scientists and engineers are optimising all of the collider’s parameters. Several technologies, some of which are completely innovative, are being developed. Increasing the luminosity means increasing the number of collisions. The aim is to produce 140 collisions each time the particle bunches meet in the centre of the ATLAS and CMS detectors, as opposed to 30 at present. To achieve this, the beam will be more intense and more concentrated than at present in the LHC. One particular challenge will be maintaining luminosity at a constant level throughout the lifespan of the beam. At present, it decreases as the protons collide and disappear. In the High-Luminosity LHC, the beam focusing (the concentration of the beam before impact) will be designed in such a way that the number of collisions remains constant. Other improvements to the beam optics are being studied, like the novel achromatic telescopic squeezing (ATS) scheme, as well as new instrumentation to measure the beam parameters. 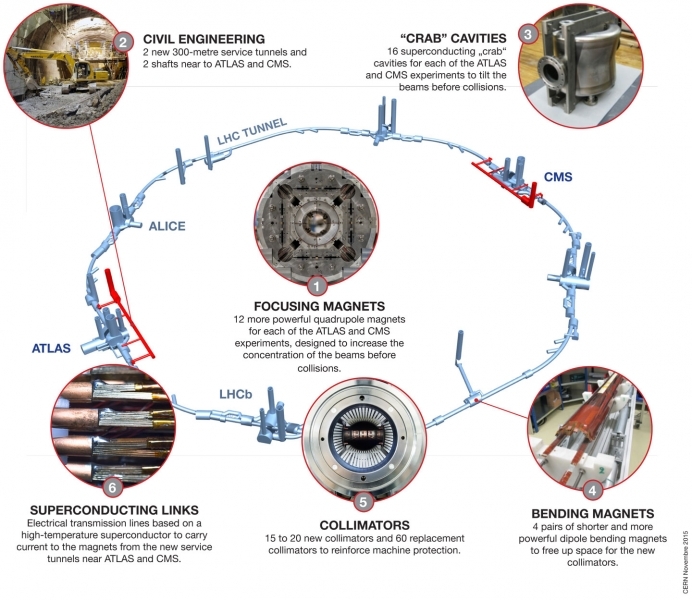 The performance of the LHC and its successor, the High-Luminosity LHC, relies on the injector chain, the four accelerators that pre-accelerate the beams before sending them into the 27-kilometre ring. This accelerator chain is being upgraded as part of the LIU (LHC Injectors Upgrade) project. A major step in the upgrade process will come in 2020 when a new linear accelerator, Linac4, the first link in the chain, will replace the current Linac2. Improvements are also planned for the three other links in the accelerator chain: the PS Booster, the PS and the SPS.